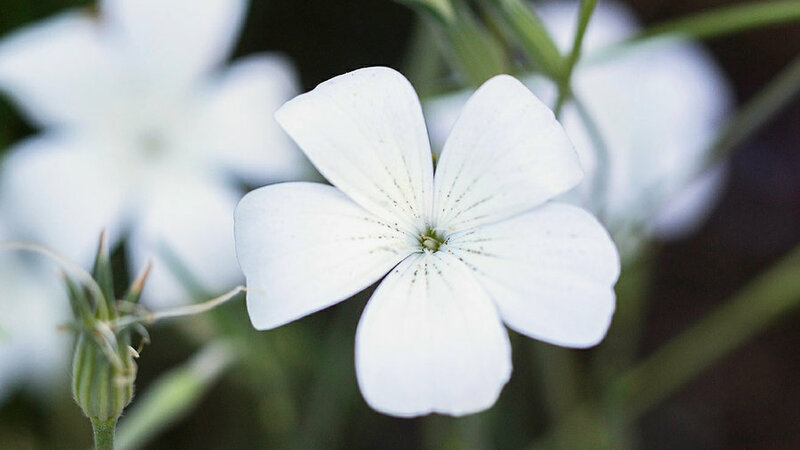 Common along roadsides and grain fields of the Mediterranean, this wildflower also makes a great cut flower. Delicate blooms are 2–3 in. wide and form on particularly long stems. ‘Ocean Pearls’ (pictured) has white flowers with black flecks, while ‘Milas’ has deep purplish pink blossoms lined and spotted in deep purple. Plants available from Annie’s Annuals and Perennials, . 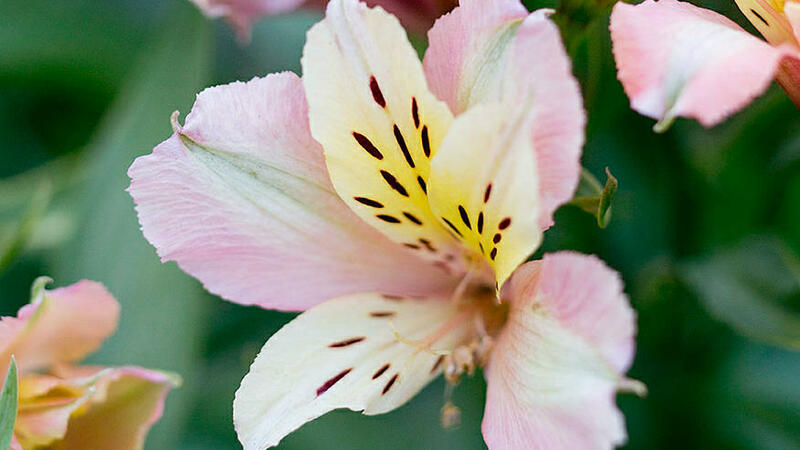 Alstroemeria hybrids range in height from 1-4 feet tall with numerous leafy flowering stems topped by yellow, orange, or orange-red flowers liberally sprinkled with dark flecks. Many hybrids were once grown only by commercial florists, who jealously guarded their plants from the home gardening public. Cut flowers can last for up to 3 weeks in the vase. Pictured: ‘Inca Ice’, available from Edelweiss Perennials, . Ornamental amaranth are grown for their brightly colored foliage and unusual drooping flower tassels that can grow as long as 4 feet. The tassels can be cut and tucked into the sides of bouquets, allowed to spill over the vase. ‘Green Tails’ (pictured) is less common than the burgundy-colored hybrids. Showy summer and fall blooming plants grow with an open and branching in habit and produce daisy-like flowers in many colors and forms. Heights vary from 2 ½ to 6 ft, with taller varieties like ‘Sensation’ (pictured) providing longer stems for cut flowers. 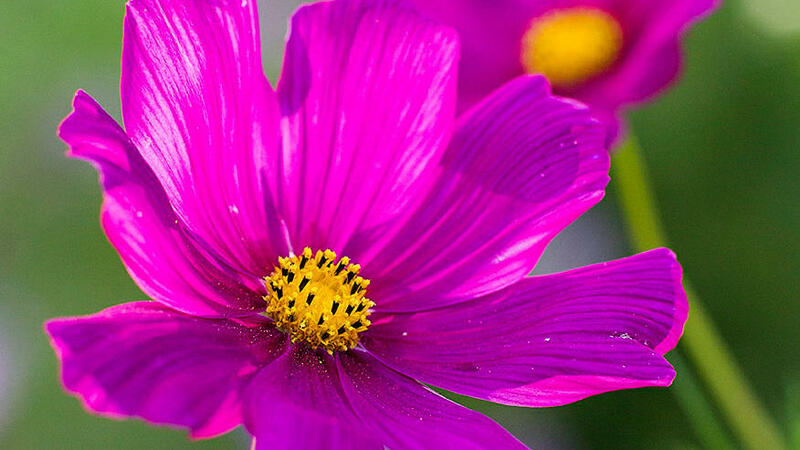 These tough, colorful perennials form long-lasting flowers on straight stems above clumps of bristly foliage. 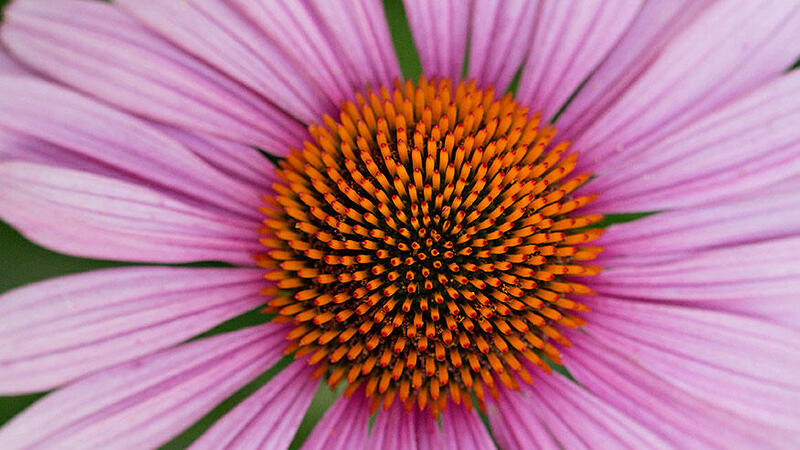 Coneflowers generally bloom from spring until the first frost, providing months of flowers to cut for bouquets. 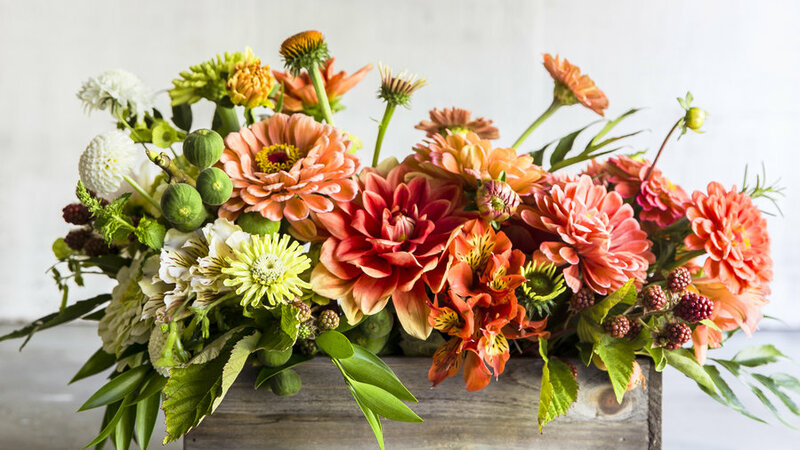 For flowers past their prime, the petals can be picked off and the spikey orange centers used as accents in bouquets. 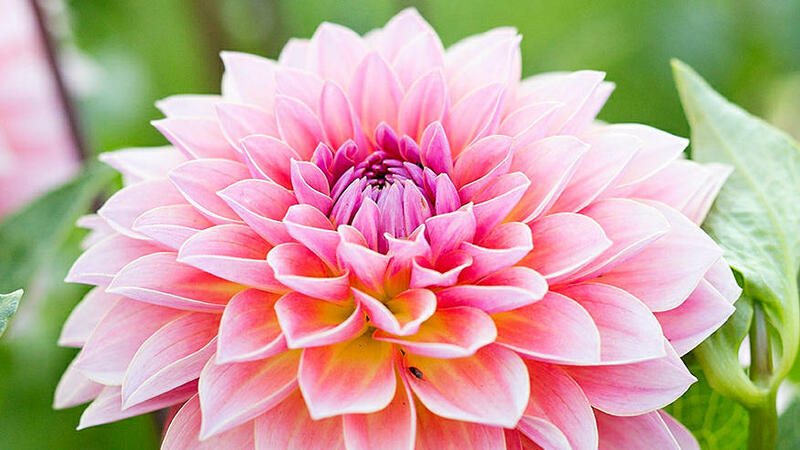 Dahlias, with their strong stems, long-lasting blooms, and substantial, attractive foliage, make striking cut flowers. Through centuries of hybridizing and selection, dahlias have become tremendously diversified, available in numerous flower types and flower sizes (from 2 to 12 inches across) and all colors but true blue. Pictured: Dahlia ‘Jitterbug,’ available through Swan Island Dahlias, . 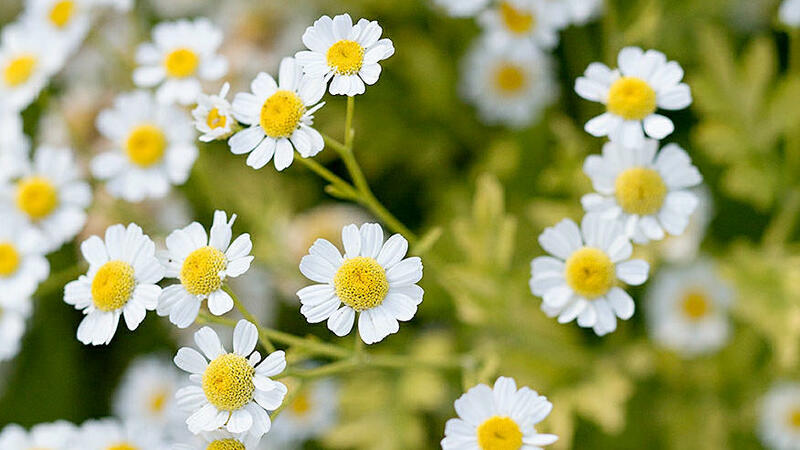 These easy-care perennials form mounding plants covered in hundreds of tiny, daisy-like flowers with both single and double-petal varieties. Cut flowers are useful as delicate fillers in bouquets. 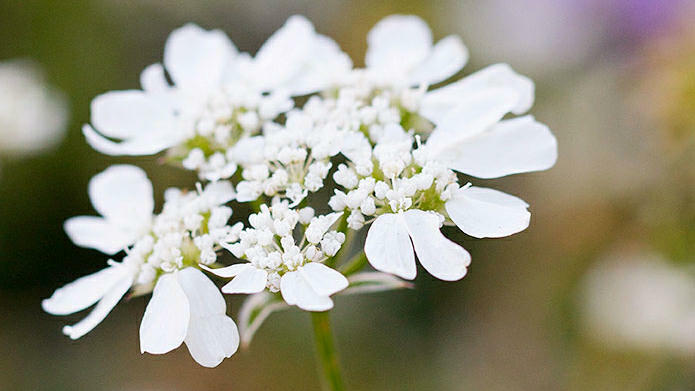 This easy-care Mediterranean wildflower has fern-like foliage and lace cap flower heads from 3-5 inches across. Reminiscent of cottage garden favorite Queen Anne’s Lace, this less weedy alternative has the same old-fashioned look in bouquets. Plants available from Annie’s Annuals and Perennials, . All Nicotiana are easy to grow in home gardens and many reseed readily. 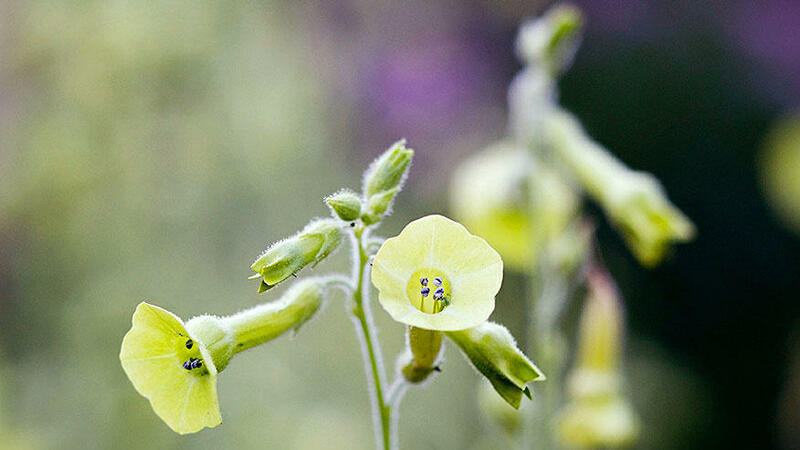 Nicotiana langsdorfii is a particularly stunning species with drooping sprays of bell-shaped bright green flowers that blend well with other cut flowers in bouquets. Grows to 5 ft. tall and 1 1/2 ft. wide. 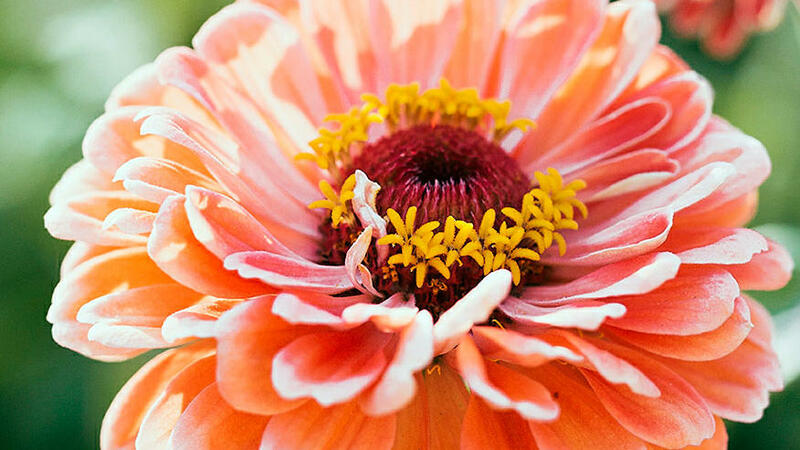 These hot-weather favorites produce flowers from early summer to fall. Plants are subject to mildew in foggy climates and when watered from overhead. Zinnias in the ‘Benary’s’ series (e.g. pictured here, ‘Benary’s Salmon Rose’) are bred to be mildew resistant and all make exceptional cut flowers long upright stems growing 3’ tall and sturdy blooms as large as 6” across. Resembling a pincushion full of needles, each Scabiosa flower has stamens that protrude well beyond the curved flower heads. Bloom begins in midsummer and continue until frost. 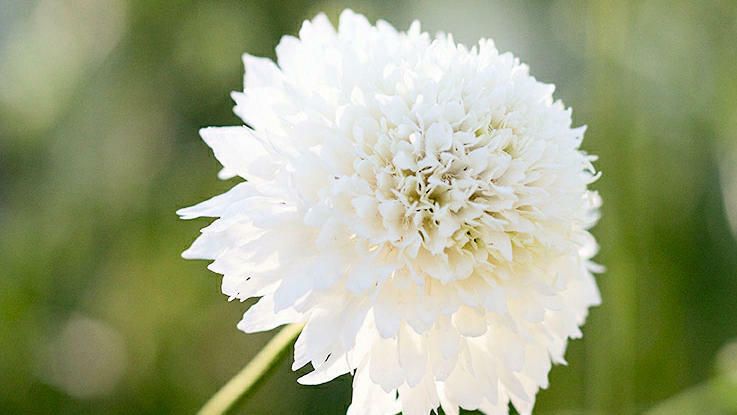 In the Sunset Test Garden, we found Scabiosa atropurpura ‘Snow Maiden’ (pictured) to be extremely productive, pumping out hundreds of pure white pom-pom blooms atop stems nearly 18” tall. 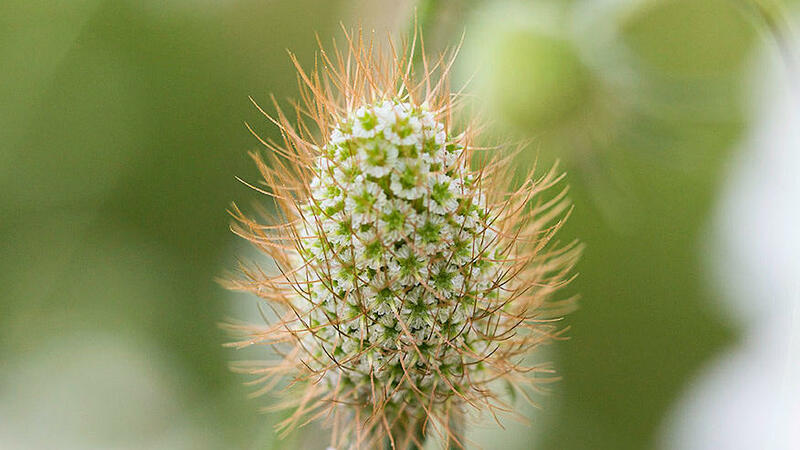 The seed heads of Scabiosa atropurpura ‘Snow Maiden’ and other varieties make interesting accents in bouquets. 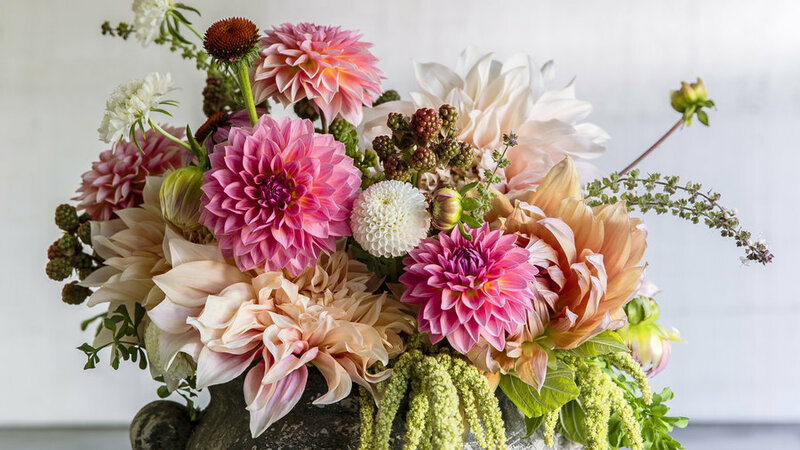 Floral designer Christina Stembel of Farmgirl Flowers picked these blooms from the Sunset Test Garden to arrange for a garden-inspired bouquet. Added to the mix are champagne-colored dahlias ‘Café au Lait’, spiky centers of spent echinacea blossoms, and Scabiosa ‘Alba’. 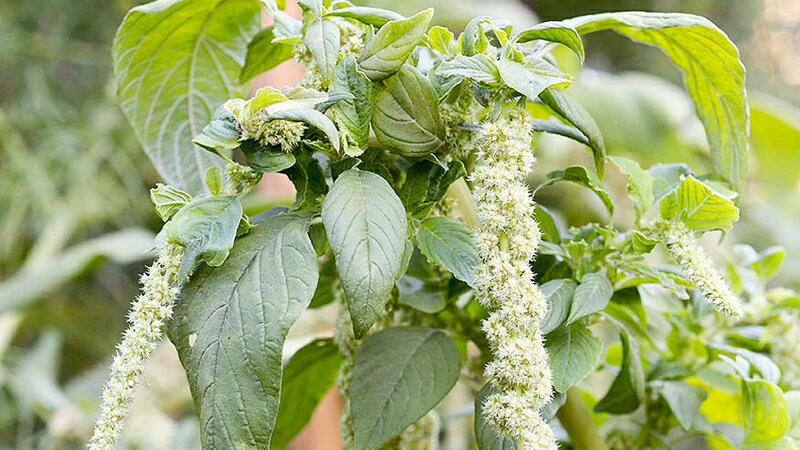 Amaranth ‘Green Tails’ spills over the sides while unripe blackberries and sprigs of Thai basil add edible and aromatic touches. Zinnias unify this combination, graduating in color from white to lime to coral. They're interspersed with unripe figs and blackberries, white dahlia ‘Tiny Treasure’, sprigs of mint, Peruvian lily, echinacea in various stages of bloom, and holly ferns for a touch of green.